I drove north to visit some friends over the weekend. We had a delightful time catching up, crafting, watching Man of Steel (that part was just okay), and hanging out in or by the pool. 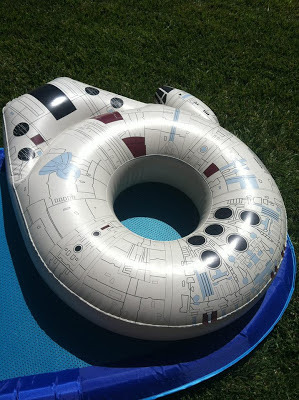 I haven't put on a bathing suit in a few years, but I brought it just in case and once I saw they had a landspeeder raft and a Millennium Falcon floatie, I couldn't resist going into the warm water. I made it across the pool in less than 12 parsecs. There was also an X-wing that shoots water. I think she said she got at least the Falcon at Target at some point, but your best bet is to shop on eBay for these. I'd like to be back there right now! happy weekend in the pool .